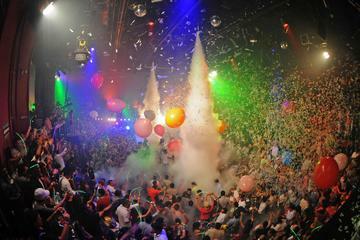 Experience the exuberant color of a fabulous festival at Playa del Carmen’s wildest nightclub with a CoCo Bongo nightclub pass. Revel in the stunning spectacle of acrobatics, luminous lights and live cover music of popular artists like Michael Jackson, the Beatles and Beyoncé. Sip fruity cocktails or sparkling wine from an unlimited open bar, absorbing the incredible atmosphere of one of Mexico’s most epic nights. Upgrade to the VIP package for an exceptionally exclusive experience; enjoy an unrivalled view of the stage from the stylish VIP section and enjoy premium service at the open bar. Embrace your wild side at one of Playa del Carmen’s most spectacular parties as you arrive at the dazzling doors of CoCo Bongo. Add an air of elegance to your evening by indulging in an exclusive VIP pass – out of the 1000+ partygoers that venture to CoCo Bongo each night, only 120 are issued with this elite ticket. Sail past the long line and slink straight into the chic area reserved especially for VIPs. Within, gaze upwards at astounding acrobats as they tumble and twist around fabric ropes hanging from the high ceiling. Immerse yourself in the electric atmosphere of the dance floor as you watch charismatic entertainers perform onstage; enjoy Elvis and Beetlejuice impersonators as you sing along to anthems by Lady Gaga, Guns N’ Roses, KISS and Queen. Make sure your glass is always half-full with regular visits to the unlimited open bar; choose from a variety of premium drinks as you look for the swift shape of Spiderman swinging from the rafters. Accept an initiation from the bar top dancers to join them on the elevated platform and showcase your special moves. If you indulged in an upgrade, expect to enjoy a spacious and segregated section that boasts incredible views of the stage. Allow courteous waiting staff to take your drinks order and enjoy the elite ambience as you sip champagne. When the lights go out and the music fades, make your own way back to your hotel in one of the many taxis waiting outside of the club. CoCo Bongo is AMAZING however DO NOT USE this local tour operator. 1: Despite us checking in TWICE this provider didn't even show up to pick us up. We called we had significant difficulty finding anyone who spoke English we speak limited spanish. Once we got a hold of someone they said they where about 15min late and they said they were around the corner. We then called again once they were an hour late and they said the bus had broken down and we should make our own way there. Then, with no directions or any offer to organsie a taxi or anything they hung up. 2: Despite telling them on the phone TWICE we wanted the VIP upgrade they didn't pass it on to CocoBongo so by the time we arrived which was after the show started because of all the delays they didn't have VIP passes left. So we missed out and had to spend over half an hour trying to get our tickets because we arrived without any documentation from the provider only our Viator voucher. As for the show itself it is amazing and well worth it. We saw people from about 20 to 60 years old and everyone was having fun. Some great dances, acrobatics, singing, and exceptional atmosphere we would really recommend it.